Gen Y (born between 1980 and 1995) in Thailand is spending is up to 80% of their income. 50% of Gen Y do not have savings, while 48% of them are unable to pay their debt on time. For an estimated 45%, spending exceeds income. There is rise in the levels of debt delinquency. Driven by these concerns, ADB coordinated with the Bank of Thailand (BOT) and Faculty of Communication Arts, Chulalongkorn University, to implement a pilot project to improve financial literacy and promote good personal finance practices among Gen Y through the use of online social networks. The pilot project emphasized the use of online social networks as tool, through an online awareness and action campaign, called "The Effortless Saving." A group of young first jobbers working in the media/ creative industry were selected to formulate and detail the online campaign. It made use of the most popular social networks, i.e. Facebook, Instagram and Twitter (Facebook appears to have been the most effective, with significant audience engagement), as the Campaign’s main media platforms to connect to the target group. The pages were intended to be the platform where the target audience interacts with the page administrators, and with each other. Interaction would be driven by content posted by the working group and the paid online influencers. The pages try to draw comments and post sharing, and encourage the audience’s own user-generated contents, relating to their own saving experiences, such as textposts, memes, and video clips. The pages were managed by an ad-hoc working group, composed of the Project’s consultants, the Campaign’s creatives, and officials from BOT. BOT would provide their expertise in financial management, while the creative team would modify the knowledge and present it in suitable fashion to attract and hold Gen Y’s attention. The objective of the campaign was to introduce these young people to practical approaches to saving without having to change their lifestyle, and to provide a platform for interacting and sharing experiences through social media. The Campaign was implemented in 3 stages: Awareness, Engagement and Retention. 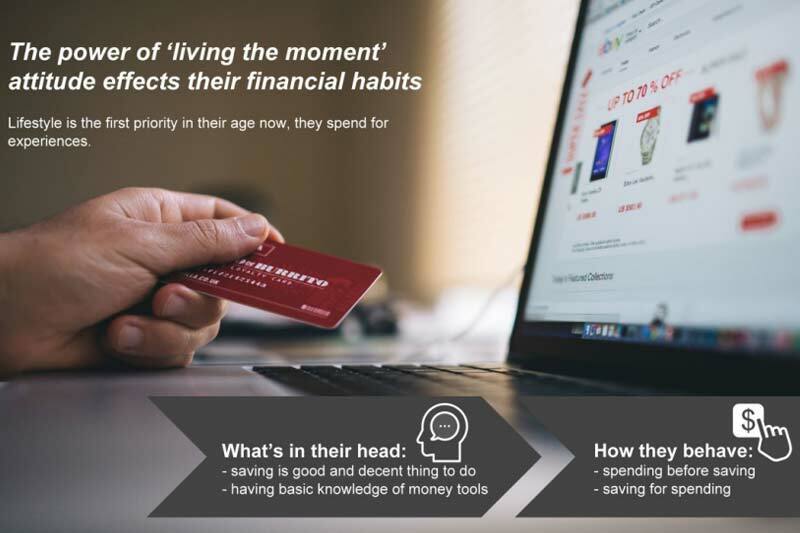 The first stage aimed to raise awareness among Gen Y by getting online media coverage and leveraging content posted by online influencers to reach the target audience with information about effortless saving. Money was spent on web advertising in in the initial stage to get the message out. In the next stage, the Campaign provided a 21-day challenge. Participants could use a web application to upload their photograph together with the amount of money they had saved, and post #effortlesssaving to their personal social media pages. Meanwhile, the effortlesssaving online pages provided information of the Campaign, along with a user manual of the web and mobile applications. In order to sustain the momentum and make maximum utilisation of the opportunities generated by the campaign, the web application and online pages will continue to be run by the working group consisting of the campaign’s creative team and staff from BOT. The project was started in October 2016 with planning and the collection of data. The campaign was launched in January 2017. The Bank of Thailand hosted the launch party for the Effortless Saving Campaign on January, 17th 2017. Despite weak attendance from online social players, the Campaign’s launch received good media coverage, which resulted in an initial short-term spike of users and visitors at the Campaign’s platforms. The pilot found that Gen-Y tends to view ‘one-way’ advice given by older generations as irrelevant and impracticable, especially when it is in conflict with their lifestyle of shopping, consuming, traveling, entertaining, leisure, etc. This is the potential source of ‘unnecessary’ resistance from the Gen-Y audience which the campaign was designed to avoid. The ‘audience-centered’ qualities were incorporated into both the content, as well as distribution process adopted. It was also found that strategic partnership and networking with key players and stakeholders, e.g. with online media, online social platforms, and online influencers (from K-pop fan clubs and fashion to travel and humour), helps ensure that the campaign reaches into as many layers and segments of the Gen Y target as possible. The Campaign also built on the extensive networks of Chulalongkorn’s Faculty of Communication Arts with its alumni and student communities across faculties and universities. Its close relationship with several major media outlets has been long established, which helped enhanced the Campaign’s public exposures. The report recommends that there should be focus on Gen Y savings for longer-term spending for things like education, professional skill training, health, family, which would make a significant difference to the quality of their lives. More functional tools such as mobile applications should also be developed to help manage and simultaneously socialise their savings with their peers and communities. ‘Social’, ‘practical’ and ‘fun’ should remain the theme of the future campaigns. In addition, they should include interesting lifestyle features such as discount online shopping store, food coupons promotion, beauty product sales, or food delivery service, etc. The BOT played an active role in the campaign, including hosting the Launch Party, and managing the web pages. The report recommends that Financial Socialisation and Social Marketing be incorporated into the implementation of the BOT programs on financial literacy. In the longer run, it might be beneficial for the BOT to strengthen its own ‘in-house’ capacities for running campaigns like this. It notes that as the central financial regulator, the BOT is the most powerful player, whose policies and actions have already had far-reaching impacts on the lives and behaviors of consumers in the country. With its regulatory tools and its networks with banking and financial industries, it is well-positioned to be a potential prime mover or a major facilitator for social marketing programs on personal finance. For ADB, the report says that partnerships with government agencies should be further explored for enhancing their awareness and capacities in social marketing. There should be emphasis on building a platform for all major stakeholders to collaborate in these social marketing efforts in a strategic and concrete manner. Click here to read the full report on the pilot project.